Full size Riley Imperial in Solid Mahogany for sale. This is another superb solidly designed example Riley table that has stood the test of time and yet still looks great. Picture above taken of a recent installation of the same table model, be assured this example will be refurbished to the same very high standard. The table at the moment is bieng stored in its compont parts awaiting full refurbishment. This table will go through the full process of refurbishment. All exterior facing wood work will be stripped and sanded. Any imperfections repaired and the whole table polished into as new condition. Table to be finished in a rich dark mahogany satin polish. The picture below is an actual Riley Imperial being made at the Riley Factory in Accrington. "Picture courtesy one of our ex Riley employees"
8 solid mahogany square & chamfered legs, solid mahogany frame. 5 piece one and three quarter inch Italian slate bed. New nets and leathers/ballrunners fitted to all pockets. Cushions and bed cloth to be recovered in Hainsworth Smart English wool napped cloth, colour of your choice, (see below). long tackle, spider rest and hangers. Ideal room size for unobructed game play 22ft x 16ft or over. 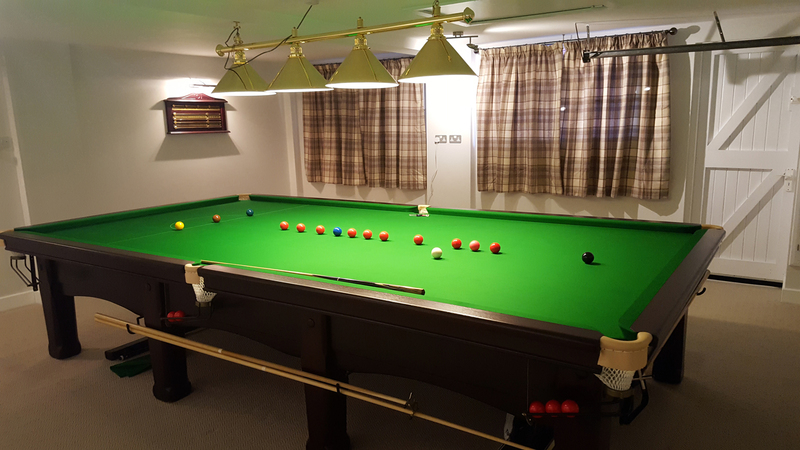 Free NW England professionally delivered and installed by one of the country's top installers "Sovereign Snooker Services". Other mainland UK usually £100. Refurbishment usually takes around 4 - 6 weeks from an order being placed to installation. Contact to arrange 20% deposit or if your snooker room is not ready to secure this table. The majority of our customers are undergoing their own snooker room developments. 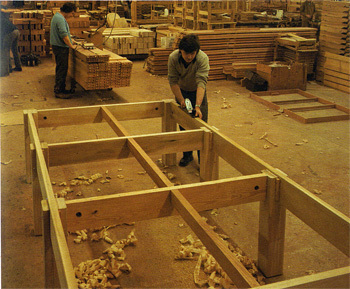 We understand that building works seldom go to plan and will hold a table until you are ready at no extra cost. Cash balance to be paid at point of installation to your satisfaction. ian@idonohoe.com 07969288786 Ian. 18/04/2019 Table price £2950 inc all the above. Hainsworth Smart and Strachan 6811 are very similar giving a hard wearing 5 - 7 yrs use. You will pay £30 extra for Strachan 6811 as you are paying for their tv advertising but Hainsworth Smart is every bit as good if not better. This is the cloth that you will find in most of the snooker halls and clubs the World over. Strachan Tournament & Hainsworth Match lasts around 12 months. This is the type of cloth you would find on a snooker hall match table. £100 extra on the price of any snooker table offered. Strachan Match and Hainsworth Precision lasts only a matter of weeks! This type of cloth is what you would find in professional tournaments. £100 extra on the price of any snooker table offered.